In China, anti-corruption campaigns are widely seen as the perfect pretext for Communist Party leaders to eliminate their political opponents. The new Chinese communist leadership famously promised that it would tackle both “tigers and flies”—meaning high-level officials, as well as low-level ones—in its own thunderous crackdown on corruption over the course of the last year. Zhou Yongkang, the former security czar and a former member of the powerful Politburo Standing Committee, has long been rumored to have been caught in the Party’s tiger trap. It is unclear whether he will go to trial, but he has reportedly been detained and interrogated. Most recently, South China Morning Post reported that, according to its sources, the authorities may be on the verge of finalizing the case against Zhou. This would precede formal, possibly public, charges. Now, Jin Zhong, the editor of Open Magazine, a well-known political journal published in Hong Kong, said that he is certain of the next target for investigation by the Party’s disciplinary authorities. It is, Jin Zhong said, none other than Zeng Qinghong. Zeng Qinghong is a secretive and powerful backroom organizer in the Chinese communist political system. He was one of the key members of what was known as the “Shanghai Faction,” along with Jiang Zemin, who was the leader of the Chinese regime in some capacity from 1989 until 2004. Zeng, under the tutelage of a powerful general, also held key posts in Party organs deep within the petroleum industry, and has been called a “spymaster” for his informants and espionage activities inside and outside China. He is widely understood to have been Jiang’s right-hand man during much of Jiang’s tenure and has been variously described as Jiang’s “enforcer” and “hatchet man.” For several years he was in charge of the Communist Party’s Organization Department, which made him responsible for key personnel decisions. 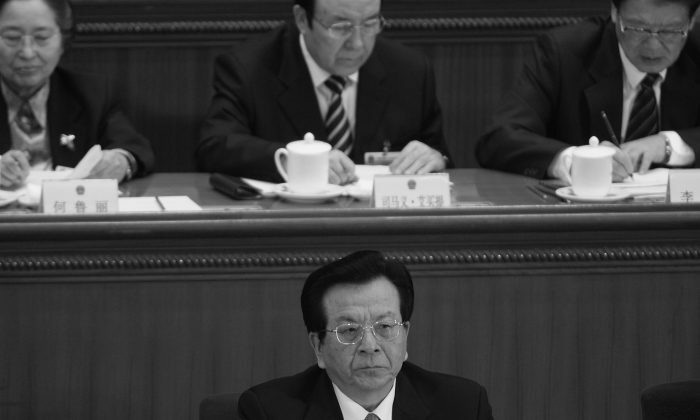 He helped Jiang appoint cronies to the top levels of the Party apparatus, observers said. These included, in part, bringing Zhou Yongkang up through the ranks. But Jiang Zemin, Zhou Yongkang, and Zeng Qinghong are also part of a faction that sought to extend its influence beyond its reign. In the most damning reports, Bo Xilai and Zhou Yongkang were together reported to have attempted to stage a coup against the leadership. Bo Xilai was known to be close to Zhou Yongkang, the former security chief. Bo was set to succeed Zhou in that role and maintain the influence of the elders—Zeng Qinghong and Jiang Zemin—in the political system. But Bo Xilai is now in jail on corruption charges. His wife was convicted of murder. Zhou Yongkang is reportedly under house arrest. And now Zeng Qinghong is said to be next on the list. In an interview with New Tang Dynasty Television, Jin Zhong laid out the case for why he believes Zeng is next in line for investigation. “Some media have said that the new big investigation is going to be against Wen Jiabao. … But from a series of recent facts, we have made a judgment: it’s definitely not Wen Jiabao,” Jin said. Jin believes his sources to be reliable because of their track record of knowing internal developments in the Communist Party’s landscape of factional fighting. The question of which faction controls power in the Party to a great degree determines the sorts of policies the regime enacts. This can touch a range of issues, from domestic security, control and use of the military, and the role of the state in the economy. The new leadership group under Xi Jinping, the Communist Party chief since November 2012, is widely seen as being in the middle of consolidating power so that it can enact new policies. Part of the process of consolidating power in communist China includes eliminating the remnants of the old guard, in this case Jiang Zemin, Zeng Qinghong, and their associates. But Zeng Qinghong, it seems, has not been showing up. There were two recent occasions when this absence became highly conspicuous. The first was in October of last year, when the Communist Party held a large and official event to mark the 100th anniversary of the birth of Xi Zhongxun, father to current paramount leader Xi Jinping. All the major aristocratic communist families in China sent a representative to the event, to pay their respects. Only two were missing: no one from the family of Bo Xilai turned up, nor did any representative of Zeng Qinghong’s clan. Instead, Wen Jiabao, an enemy to these men, was featured prominently at the official event. More recently on Jan. 10 in Hong Kong, a funeral for Run Run Shaw, a storied film mogul well known in China, was held. Many top Party leaders, including Xi Jinping, were reported in the Chinese press to have sent notes of condolence. Among these were former officials involved in relations with Hong Kong. But Zeng Qinghong, the founding official of the Central Leading Group on Hong Kong and Macau Work, the Party’s peak internal body for relating to the two territories, was nowhere to be found. None of this, of course, bodes well for Zeng’s prospects. China’s anti-corruption agency proudly reports a record number of corrupt officials placed under investigation, but should they be proud?